The newly married Duke and Duchess of Sussex, Prince Harry and Meghan Markle, leave Windsor Castle in a convertible car after their wedding in Windsor, England, to attend an evening reception at Frogmore House, hosted by the Prince of Wales, May 19, 2018. The Duke and Duchess of Sussex departed in glamorous style for the second reception of their wedding day. 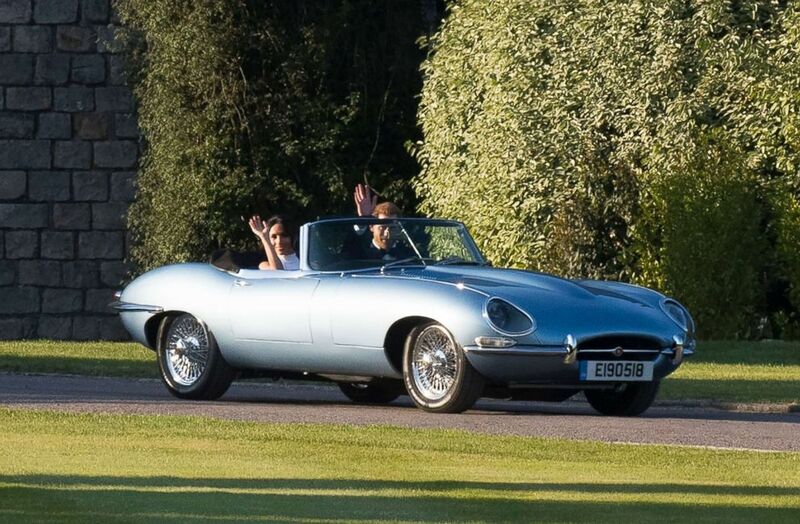 Prince Harry, 33, drove Meghan Markle, now known as the Duchess of Sussex, away in a silver blue Jaguar to make the approximately 15-minute drive from Windsor Castle to Frogmore House, the site of their evening wedding reception. 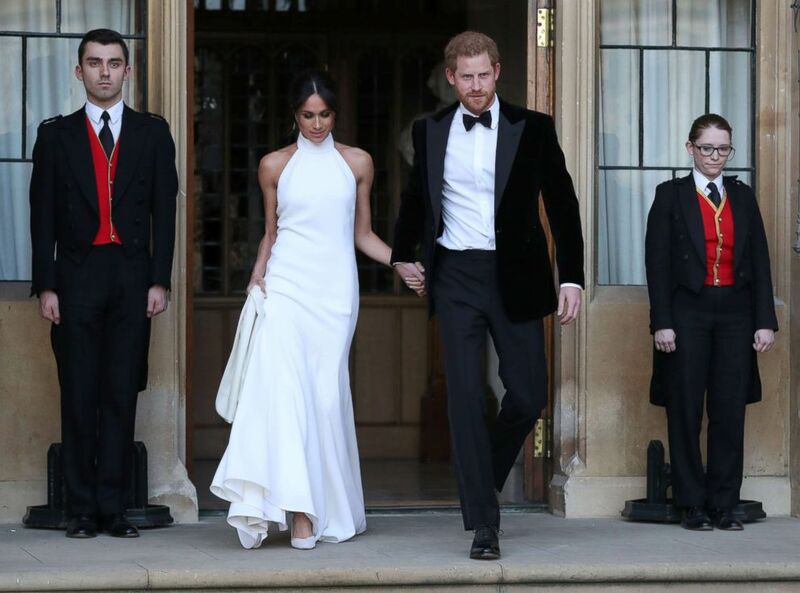 Duchess Meghan, 36, was again a vision in white, donning a bespoke lily white high-neck gown made of silk crepe by designer Stella McCartney. The newly married Duke and Duchess of Sussex, Prince Harry and Meghan Markle, leave Windsor Castle after their wedding to attend an evening reception at Frogmore House, in Windsor, England, May 19, 2018. The bride chose her shoes to have a hint of something blue. The soles of her silky satin shoes by Aquazurra were painted in baby blue, according to Kensington Palace. 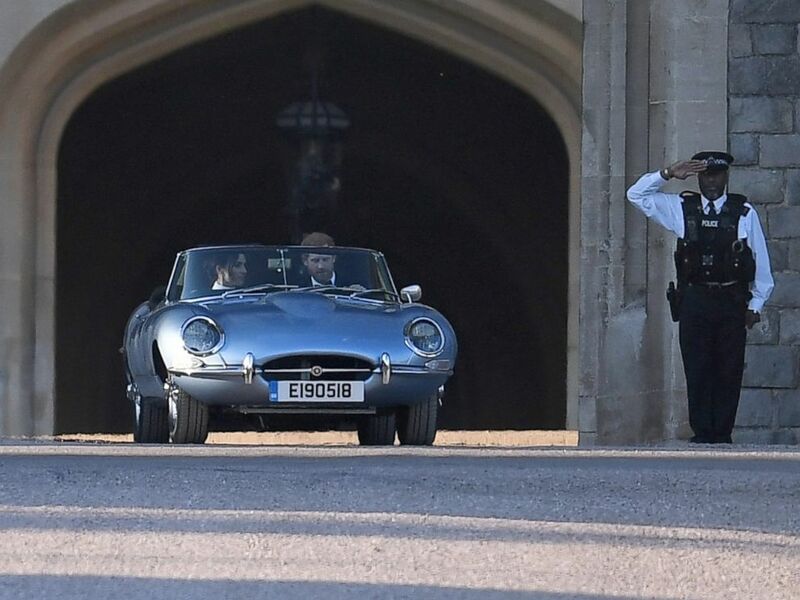 The license plate on the blue Jaguar in which Harry whisked Meghan away to their reception showed the couple's wedding date, E190518. The reception at Frogmore House –- where Meghan and Harry took their engagement photos –- is a private affair for 200 of the couple's closest friends. 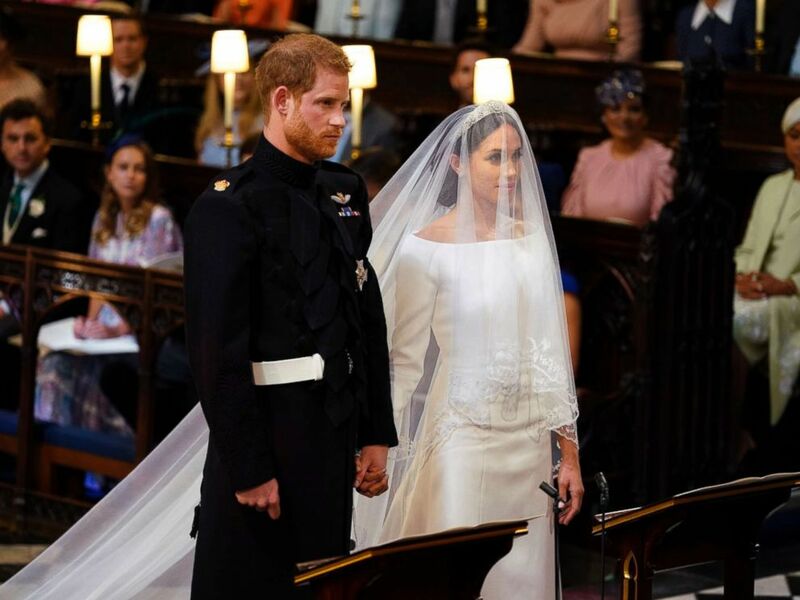 The celebration is hosted by Prince Charles, who earlier in the day escorted his new daughter-in-law to Harry at the altar at St. George's Chapel. The reception is an opportunity for Harry and Meghan to celebrate their marriage privately with their closest family and friends. No details of the evening will be released by Kensington Palace. 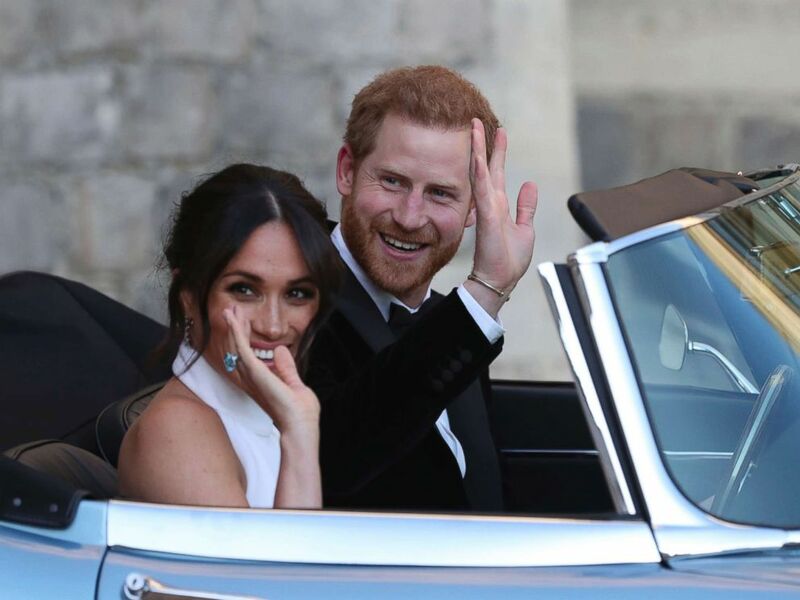 The newly married Duke and Duchess of Sussex, Prince Harry and Meghan Markle, leave Windsor Castle in a convertible car after their wedding in Windsor, England, to attend an evening reception at Frogmore House, May 19, 2018. If rumors prove true, there could be everything from food trucks to performances by A-list musicians. 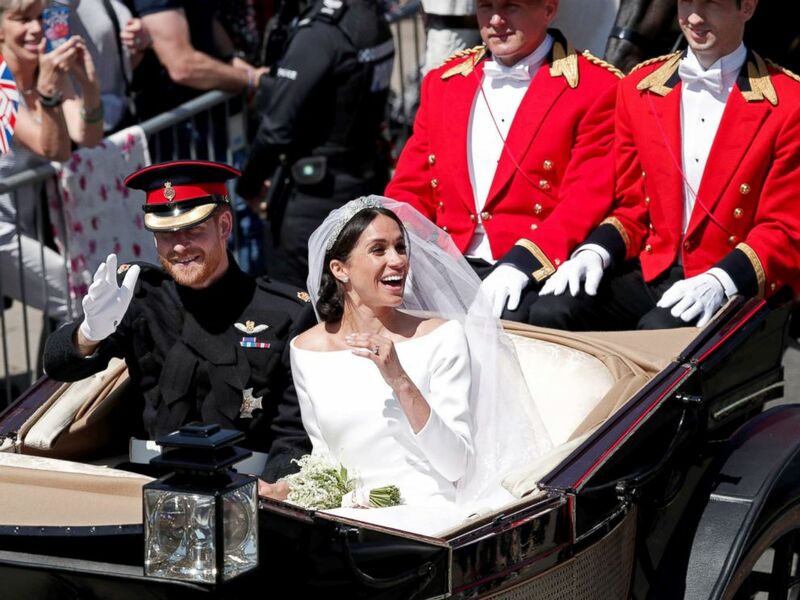 The newly married Duke and Duchess of Sussex, Prince Harry and Meghan Markle wave as they leave Windsor Castle by car to attend their reception in Frogmore House after their royal wedding ceremony in Windsor, England, May 19, 2018. Elton John performed at the lunchtime reception Queen Elizabeth hosted for Meghan and Harry after the wedding service at St. George's Chapel. The approximately 600 guests who attended Harry and Meghan’s wedding were invited to the reception at St. George’s Hall. That means celebrities including Oprah Winfrey, Serena Williams, Idris Elba, James Corden, James Blunt, George and Amal Clooney, David and Victoria Beckham, Priyanka Chopra and some of Meghan’s former “Suits” co-stars broke bread alongside Britain’s royal family and elite. Meghan was scheduled to deliver her own speech at the reception, as were Harry and his best man and brother, Prince William. The reception featured Meghan and Harry's show-stopping lemon elderflower cake with buttercream icing and fresh flowers as decorations. Meghan wore Givenchy when she walked down the aisle to wed Harry. 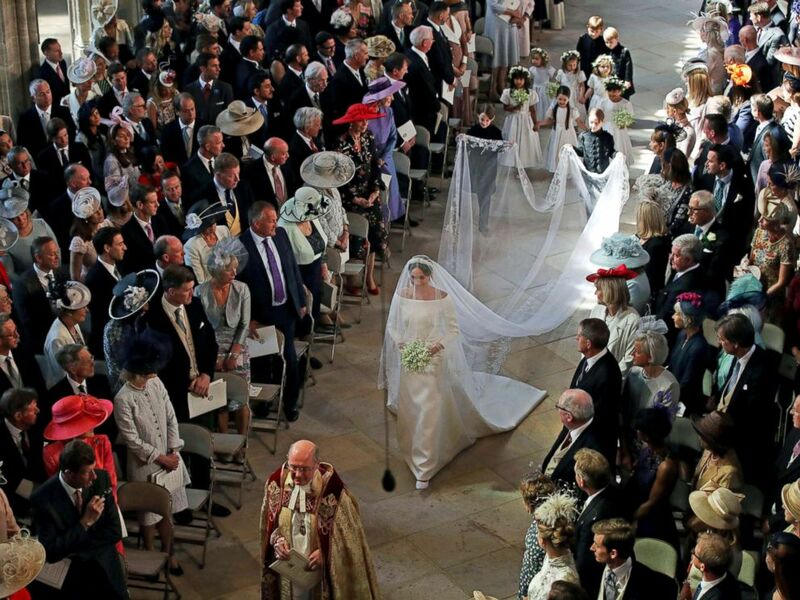 Her gown -- made of triple silk organza and featuring an open bateau neckline with three-quarter-length sleeves -– was designed by British designer Clare Waight Keller. Britain's Prince Harry and Meghan Markle stand, prior to the start of their wedding ceremony, at St. George's Chapel in Windsor Castle in Windsor, May 19, 2018. Keller, 47, is the first female artistic director to head the house of Givenchy. Meghan chose Keller, in part, because she wanted to “highlight the success of a leading British talent who has now served as the creative head of three globally influential fashion houses -- Pringle of Scotland, Chloé, and now Givenchy,” according to Kensington Palace. Harry and Meghan will return to their royal duties quickly after their wedding day. They are scheduled to attend their first royal engagement as the Duke and Duchess of Sussex on Tuesday.